We’ve already seen a regular variant of the McLaren 570S, a cheap variant called the 540C, and a slightly softer variant called the 570GT. And now it’s heading to the track, with the McLaren 570S Sprint and the McLaren 570S GT4. 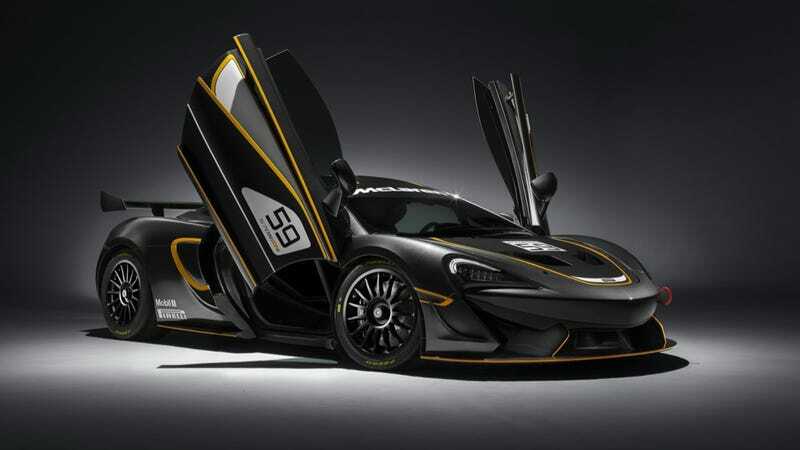 The racing 570S looks pretty much exactly how you would expect it to, which is a regular 570S with a tennis court mounted atop aluminum spindles for rear downforce, and a Habsburg jaw underneath the front for, er, front downforce. The Sprint isn’t intended for competition, but for regular track days. Because it’s not bound by racing regulations, it’s a bit nebulous as to how quick it will be or what it will exactly look like, but McLaren says it can be “upgraded” to GT4 specification. In other words, expect it to be in much the same vein as the track-only 650S Sprint, which had things like an FIA-approved roll cage, six-point harnesses, and also air conditioning because damn it a track car should be comfy. The GT4, on the other hand, is a pure racer through-and-through. It’s got the first carbon fiber chassis in the GT4 category, with a body made out of carbon fiber and aluminum, along with that fat wing out back. And since it’s GT4 racing, it’ll have the 3.8-liter turbocharged V8 out of the regular 570S, although likely actually toned down a bit to make for a more even playing field. Even still, it’ll probably be a hoot.